A* in Mathematics required. Further Mathematics preferred. If you are studying both then the A* can be in either subject. A score of 19 points in three higher level subjects including grade 7 in Mathematics, with no score lower than 5. A score of 17 points in three higher level subjects including grade 7 in Mathematics, with no score lower than 5. D2,D3,D3 in three Cambridge Pre-U Principal Subjects. Mathematics at D2 required. Further Mathematics is preferred. If you are studying both subjects then D2 can be in either subject. The programme is accredited by the Royal Statistical Society (RSS) enabling you to be granted Graduate Statistician (GradStat) status if you achieve second-class honours or above and choose at least 50% of your year two and three modules in statistics (please see accreditation note). Teaching is enhanced by the varied research interests of our academic staff; from the foundations of the subject to applications of statistics in science, medicine, industry, economics and finance. The department offers a friendly and supportive atmosphere, where small-group teaching and personal attention are available for all students. The UCL Centre for Languages & International Education (CLIE) offers comprehensive facilities, including a DVD library, language laboratory, computer-assisted language learning, satellite television, resource books, journals and newspapers. This programme is accredited by the Royal Statistical Society. On application to the Royal Statistical Society, graduates are awarded Graduate Statistician (GradStat) status, providing formal recognition of a member's statistical qualifications, subject to achieving second class honours or above, and at least 50% of your year two and three modules are in statistics. Please note: current accreditation extends until 2017/18. We are applying to retain it for eligible students who enrol from 2018/19 onwards. The statistics component of the programme is based on the Statistics BSc. Your first year will include mathematics, statistics and some computing, which will be followed by increasing specialisation in statistics in the second and third years. The economics component includes a foundation in micro- and macroeconomics and a range of optional modules in economics, econometrics and finance. When you start the programme you will be asked to nominate a language (Arabic, French, German, Italian, Japanese, Mandarin or Spanish), and you will follow modules in this language and its associated culture. Each language is offered at a range of different levels, from modules for complete beginners to advanced post A level modules focusing on the use of the language in a business, professional or academic context. The starting level is flexible and will depend on your prior knowledge of your chosen language. It is also possible to study two foreign languages in this degree programme if you have sufficient prior knowledge of one of these languages. Any remaining credits can be selected from a wide range of options including modules in your chosen language. You will select 3.0 credits from a wide range of options including modules in your chosen language. We employ a variety of teaching methods which include lectures, small-group tutorials, problem classes and computer workshops and e-learning. Lecturers have regular 'office hours' during which you are welcome to come and ask questions about the programme material. Most modules are examined at the end of the academic year in which they are taken using a combination of end-of-year examinations and in-course assessment. Prizes may be awarded to the most outstanding students in the first, second and third year. 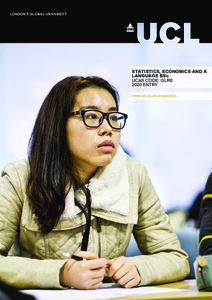 Detailed course descriptions are available on the department website: Statistics, Economics and a Language BSc. Together with subject-specific knowledge, the programme is designed to equip you with skills valued by employers including: advanced numeracy and quantitative skills; analytical and problem-solving skills; and computing skills. You will also develop your research skills, communication skills and word processing skills through statistical project work. The demand for graduates with training in statistical science is now a permanent feature in both advanced and developing countries for jobs in finance, commerce, industry, research, education and government. Graduates from this department are well-represented in all these fields, in this country and overseas, and recent graduates have continued to be successful in obtaining a wide variety of jobs. Popular career choices of previous graduates include the financial sector, training in the actuarial or accountancy professions and jobs in industry and commerce. Postgraduate study, for example in advanced statistics, medical statistics, actuarial science, finance or economics, provides further options. The department offers an undergraduate scholarship, the EJ Gumbel Scholarship. When we receive your application we will consider your academic record, your predicted grades, your personal statement and your reference. Your application should demonstrate high academic ability, particularly in mathematics, an informed interest in all components of your chosen degree programme and good communication skills. Attendance at an open day may be required; in special cases, candidates may be interviewed. We will decide whether to invite you to an applicant open day on the basis of our assessment of your application. Your visit will include an opportunity to meet staff and current undergraduates, a tour of UCL, a taster lecture and introductory talks about the department and degree programmes.